At this page you can find the contributions of the school in the UK (Bridgwater). The artcles in the other languages you can find by clicking on the flags. Karen May delivered the power point to my personal tutor group at Bridgwater and Taunton college, we were able to discuss "sustainability and the students were able to research in small groups to explore this. We then shared our knowledge and understanding in these areas. 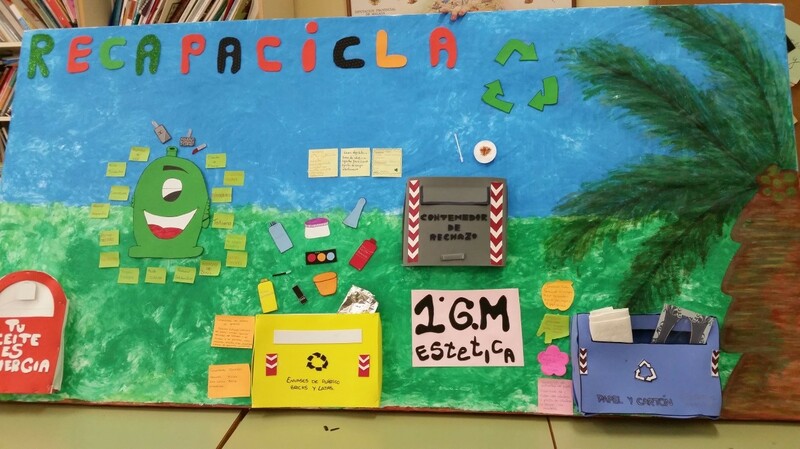 The students feedback was a positive one, they now have a better understanding of Sustainability and are already considering ways that they can improve some areas in which this could have a more positive impact. 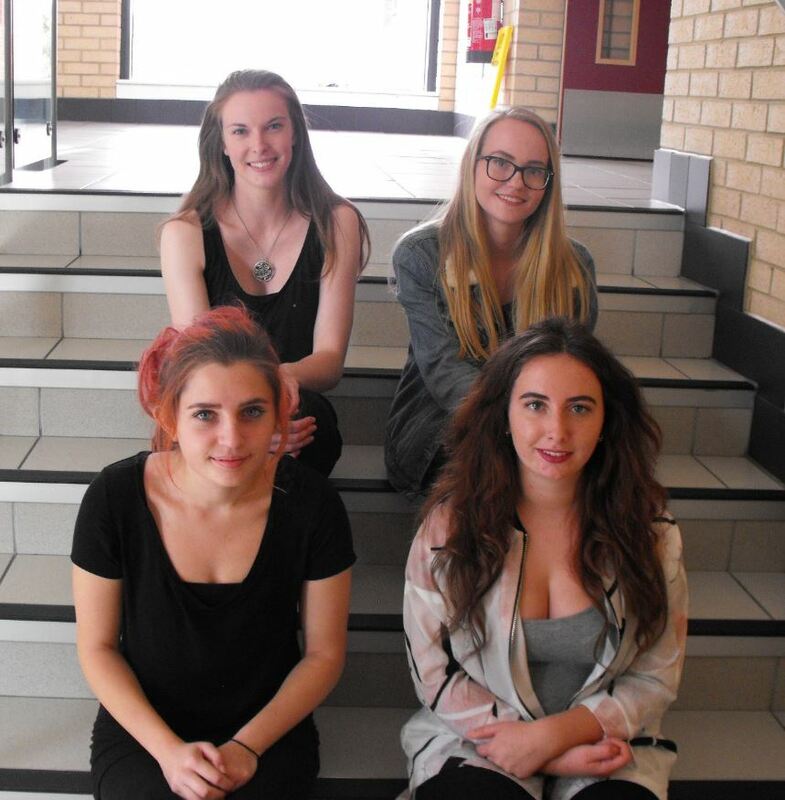 Four students will be attending the visit in Malaga/Madrid next month with the teachers involved in the project - Lucinda Vaughan and Karen May. I am Ellie-Mae from Bridgewater. In college I studied beauty therapy level 2 and am currently studying complimentary therapy level 3. In this green salon project I have learnt how to make an salon more sustainable. 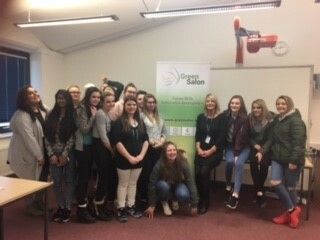 On Tuesday we went Loreal and had a talk about how they recycle their products and use it to decorate their salon. 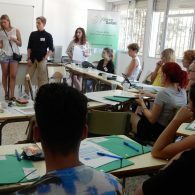 On Wednesday we went into groups with people from other countries such as Spanish, Dutch and Danish. We split into four groups and did a video on how to make a salon more sustainable. My group did about hair, for example we recorded the hairdresser washing hair with and without gloves. When washing hair you should wear gloves so that you don’t spread bacteria in the clients hair. 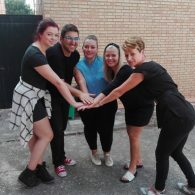 As well as hair my group did about manicures we recorded a video of me being the beautician trying to exfoliate the clients hand with a bracelet on. The client knew she shouldn’t have it on as it gets in the way of treatment. On Thursday we split into groups of two-four people. Went with two Spanish people and one Danish person. We went into the main town of Malaga and interviewed salon owners asking them about how sustainable their salon is. We shared our experiences when everyone got back, most salons admitted they don’t wear gloves. 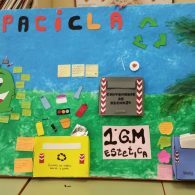 By doing this project I have learnt that our generation need to make the planet more sustainable to help save people as well as te planet. Over all I have enjoyed the experience. 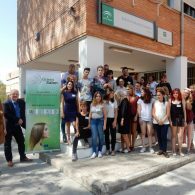 After visiting Malaga and working with the partners and students of this project, it is clear that there is not enough awareness regarding green energy and making salons more sustainable. 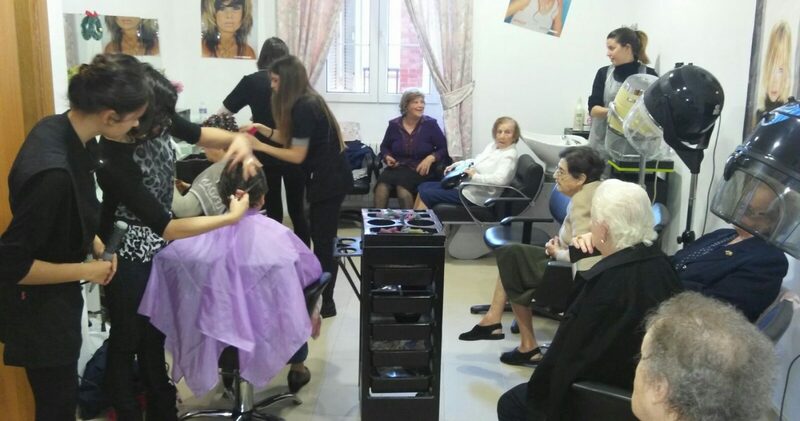 It became obvious after visiting salons in Malaga that owners are not educated enough when it comes to the safety and sustainability of the hairdressing an beauty industry. This means that they could be putting themselves and their employees at risk of health problems, and they could also be contributing to environmental damage. Increasing the awareness of the issues surrounding sustainability will be really beneficial to hairdressers and beauticians around the world and will also help us to preserve the natural environment that surrounds us. By expanding the level of health and safety training we can help to reduce health risks by training hairdressers/beauticians to wear the correct personal protective equipment to carry out their jobs, and educate them about the health issues that they are putting themselves at risk of. Our trip to L’Oreals green salon was a very interesting experience, and I have learned about some new ways to be sustainable, for example : using the waste water from the basins to flush the toilets or using recycled wood and other materials as décor. 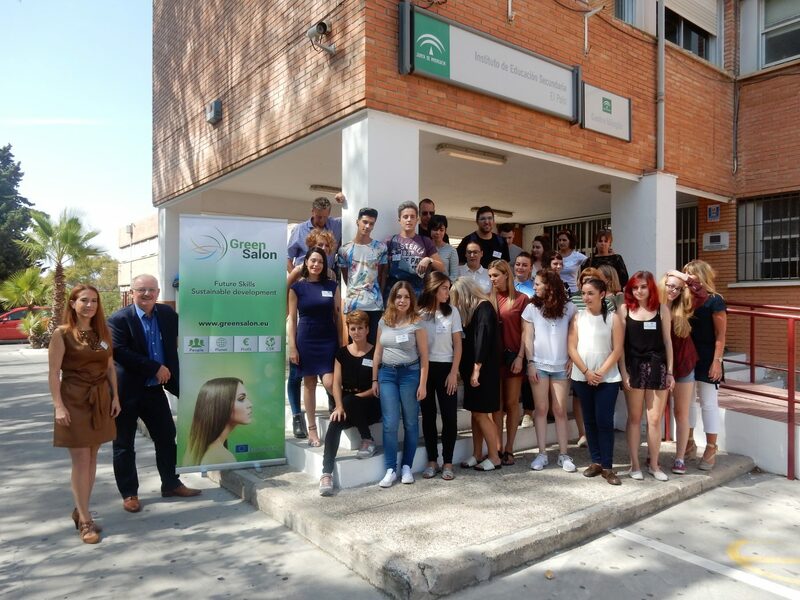 I have thoroughly enjoyed my few days in Malaga and have enjoyed learning more about the salons and how we can work together to improve them and create a sustainable and eco-friendly workplace. I am excited to begin the next part of this project. 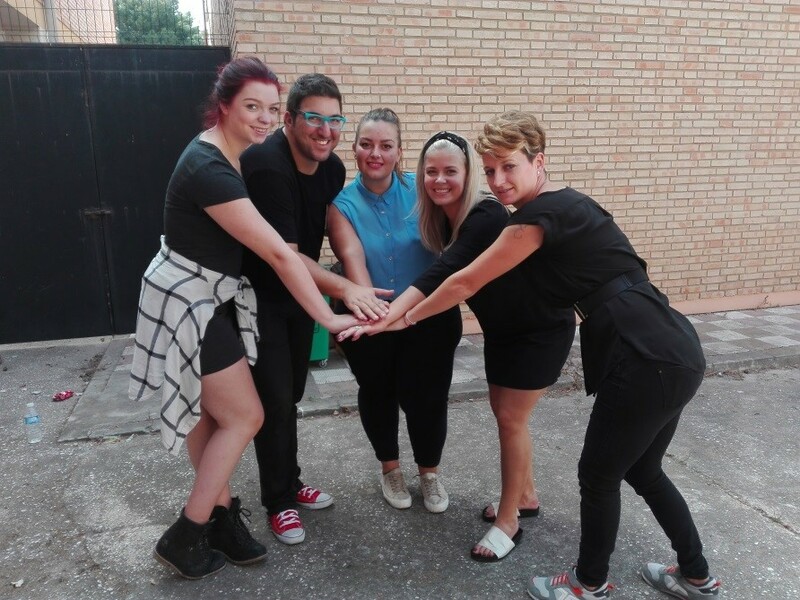 After visiting several of the Spanish hair salons in Malaga and questioning the owners we found out a lot about their views on the sustainability and health and safety in the salon. 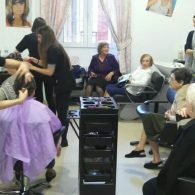 For example in the first salon we visited the hairdressers used gloves for things such as dying, wash and perming hair. However was not aware that certain chemicals are toxins and that products can be sensitizers so you can develop and allergy over time. The salon was also very spacious and plenty of room and some ventilation through keeping the door open. The second salon we visited was much smaller with more employees and only had ventilation in certain areas of their salon, despite a strong smell of ammonia when walking in. she also said that she sometimes suffers from headaches, so perhaps the ventilation in such a small working area is very poor and that is the cause of the problem. However she did answer positivity to most of the health and safety and sustainability related questions. On difference between the two salon owners was that the first was a lot older and had been a hair dresser for longer whereas the other was younger and had worked as one for less years. In my opinion I think that older, more experienced hairdressers prefer to stick to their own ways whereas younger ones are more updated on their knowledge on health and safety. Therefor I think it is important to educate the younger generation of hairdressers and beauticians now so they can learn how to be more sustainable in the future, then hopefully all salons will become environmentally friendly and take health and safety procedures more seriously. Over all I have had a really good experience and learnt a lot.